He fears new technologies could cause a third of the nation's jobs to disappear. Andrew Yang, a businessman who declared his candidacy for the 2020 Democratic nomination for president back in 2017, said that his proposal to provide every American adult with a $1,000 guaranteed monthly income is a plan to evolve the U.S. economy for the 21st century. "We have to solve the problems that got Donald Trump elected in 2016," Yang told ABC News Chief Anchor George Stephanopoulos on "This Week" Sunday. "And to me the main driver of his victory was that we automated away 4 million manufacturing jobs in Michigan, Ohio, Pennsylvania, Wisconsin, the swing states he needed to win." Yang, 44, said he is running for president because he fears that new technologies will cause a third of the nation's jobs to disappear. Born to immigrants from Taiwan in Schenectady, New York, Yang studied economics and political science at Brown University and went on to Columbia University's law school. After briefly working as a corporate lawyer, Yang became a small business owner and went on to work for a healthcare startup. Yang then ran a national education company that was eventually purchased. Yang took the earnings from the purchase and committed "to create jobs in cities hit hard by the financial crisis." Yang then founded an organization, Venture for America, that helps entrepreneurs create jobs. Yang's core campaign proposal, a form of universal basic income that he calls the "freedom dividend," would consolidate some welfare programs and ultimately provide each American adult over the age of 18 with a $1,000 check from the government each month. He cited Alaska as a potential model for the proposal. There, citizens receive an annual check from the state, funded by money from oil and mineral leases in the state. "Well this has been in place in one state, Alaska, for almost 40 years, where it's universal. Everyone in the state gets between $1,000 and $2,000 a year from oil money," Yang said. "And because it's oil money, there's no stigma attached, it's not a rich to poor transfer, and it's wildly popular in a conservative state." He added, "So what we have to do is we make it a right of citizenship for all Americans and do what they are doing in Alaska with oil money, with technology money for everyone around the country." The Alaska dividend has been in place since 1982. When pressed by Stephanopoulos on the funding for the "freedom dividend," Yang said the cost of his plan, which is estimated to be in the trillions, could be funded by a value added tax, or VAT. "What we have to do is, we have to join every other advanced economy and have a value added tax that would fall on the Amazons of the world, and because our economy is now so vast at $20 trillion, up $5 trillion in the last 12 years, a value added tax at even half the European level would generate over $800 billion in new revenue." 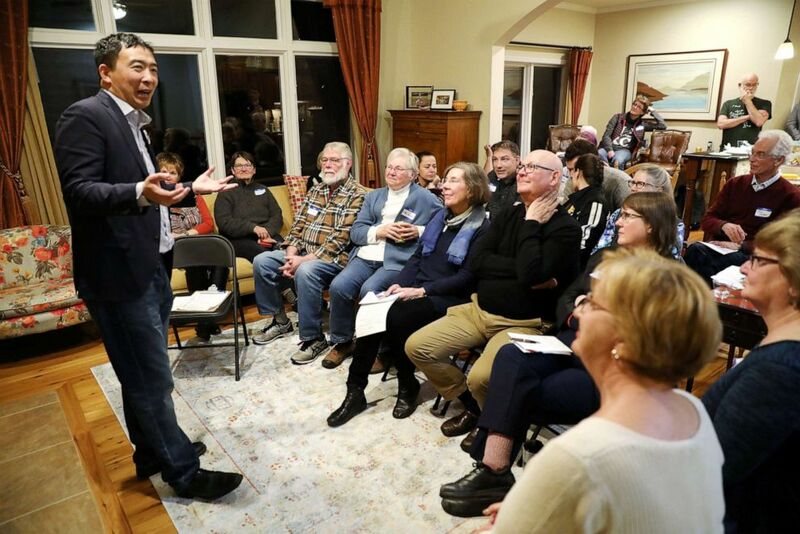 (Scott Morgan/Reuters) U.S. 2020 Democratic presidential candidate Andrew Yang speaks at Potluck Insurgency, a local democratic activist event, at the home of one of its members in Iowa City, Iowa, March 10, 2019. Yang bills himself as a political outsider because he is "not a career politician." Instead, he describes himself as "an entrepreneur who understands the economy." Stephanopoulos asked how Yang plans to turn his online following into votes. Yang said, "Well the great thing, George, is that, you know, I'm already polling nationally at one percent to three percent depending upon the poll and most people have still never heard of me. So as more people hear about me and my message and my vision for a trickle-up economy from people and families and communities up, our support will keep on going." ABC News' Christopher Donato and Kendall Karson contributed to this report.